The opener is a complex motorized device that automates the movement of your gate and allows you to open and close it with zero effort. When the unit works the way it's supposed it, it's a great addition of convenience. But when it doesn't, it can be a real nuisance. The first step would be to find the cause of the problem. So your gate opener is not working and you don't know what to do. Don't worry. That's where our experts come in. Our technicians have a comprehensive troubleshooting routine that is guaranteed to discover the source of the problem with your electric opener. From loose wires to a short circuit to damaged gears and anything else, our team knows these devices inside and out. If your gate keeps opening back up when you try to close it, or if it gets stuck suddenly and won't budge, our specialists will be able to help. Our skilled technicians are fully trained to fix any type of gate opener, from ones that use articulated arms as drive systems, to ones designed to work with sliding-type systems. Fixing these devices can be difficult, as there are lots of mechanical and electrical components involved in their operation, and a lot of experience and skills are required. Rest assured that our experts have all the necessary pedigree to handle any issue, big or small. Sadly, not all opener problems can be repaired, particularly if you have an older model. If your old gate opener has seen better days, it's time for a change. Don't think of this as a negative scenario. Newer models come with a lot more features, and many of these features deal with safety. Our experts can help you decide between the different available options and ensure that you find a unit that meets all your needs. 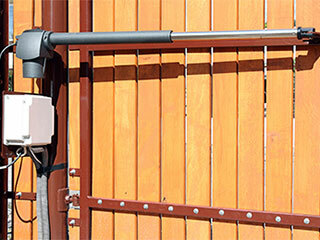 Gate Repair Santa Monica, CA is waiting to provide the help you're looking for. If you're looking for a modern gate opener made by such major brands like LiftMaster, All-O-Matic, and Elite, our vast range of products won't disappoint. Give us a call today and let us know what you need help with.